A recent systematic review and meta-analysis shows that at worse antidepressants are not effective for juvenile depression and at best better research might proof this conclusion wrong. Juvenile meaning depression among children and adolescents. 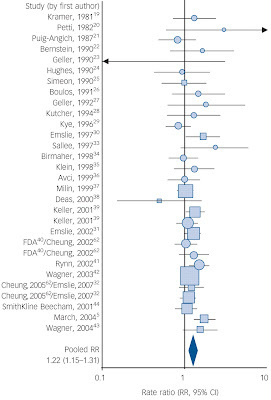 The figure above is the forest plot of this systematic review:Forest plot of rate ratios (RR, with 95% CI) of responses to drug or placebo in 30 randomised double-blind placebo-controlled comparisons of rates of ‘response’ to antidepressants v. placebo, with overall pooled RR (1.22; 95% CI 1.15–1.31; blue diamond). Antidepressants of all types showed limited efficacy in juvenile depression, but fluoxetine might be more effective, especially in adolescents. Studies in children and in severely depressed, hospitalised or suicidal juvenile patients are needed, and effective, safe and readily accessible treatments for juvenile depression are urgently required. My opinion is that selection of juveniles with relatively heterogeneous illnesses can explain the lack of efficacy. Maybe only juveniles with melancholic or psychotic depression respond to antidepressants. This is comparable to depression in adults. Importantly, prepubertal children with depression may differ biologically from adolescents or adults, and it remains unclear whether depression in prepubertal children is a substantially different disorder from that found in adolescents or adults, perhaps including developmental differences in either the pharmacodynamics of antidepressants or in their clinical effects. Didn’t a recent study find that antidepressants were not that effective with adults either – perhaps they are just not that effective overall?